The ruling Democratic Party (DP) said Thursday it has accepted the resignation of its vice floor leader, who stands accused of peddling influence at a court. 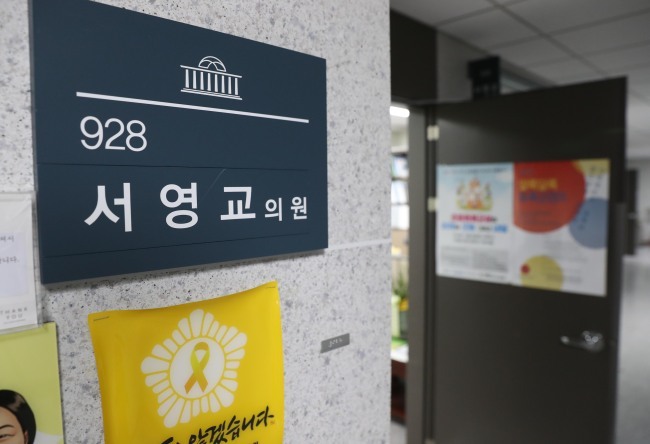 Rep. Seo Young-kyo is alleged to have called a judge into her office in 2015 and asked to have the level of punishment reduced for a son of her acquaintance, who was then on trial on charges of attempted sexual abuse. DP spokesman Lee Hae-sik said Seo expressed her intention to resign from the vice-floor leader position earlier in the day on concern that her scandal could burden the party. Seo, however, denied the allegations, Lee said. The party said it will not take any measure against another lawmaker accused in a separate scandal. Rep. Sohn Hye-won of the party is suspected of having mobilized her relatives and aides for speculative investment in real estate properties in Mokpo, 410 southwest of Seoul, which were later designated as cultural asset sites.